A few weeks ago, I received the new YEAR’S BEST SF volume as edited by Gardner Dozois. As ever, its indispensable “Summation” preamble contains the best available figures for the annual sales of the major sf magazines. Last year, I copied those sales numbers up here, and accidentally set off a bit of a storm in the sf blogosylum. Dozens of sites and hundreds of people got caught up in talking about the state of sf magazines and the condition of short sf, and what future, if any, they have. In the aftermath, a few publishers actually sent me their magazines. And, in the interests of fair play, I bought subscriptions to a few. 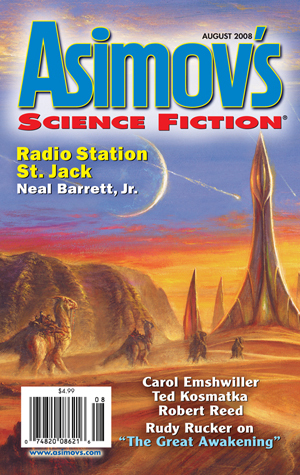 ASIMOV’S: subscriptions down to 14084 from 15117, newsstand sales rose from 3419 to 3497. Not the huge overall circulation losses of previous years, but that’s still a thousand bodies going missing. ANALOG: subscriptions down to 22972 from 23732, newsstand sales sank from 4597 to 4427. This is victory condition, in the face of posting seven- and eight-percent losses in the previous couple of years. 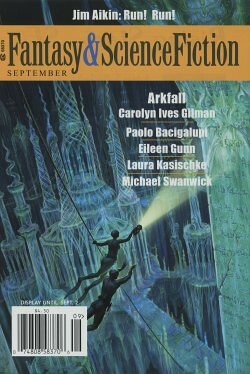 THE MAGAZINE OF FANTASY AND SCIENCE FICTION: subscriptions down to 12831 from 14575, newsstand sales sank from 3691 to 3658. No numbers available for INTERZONE beyond Dozois’ usual statement that circulation is in “the 2000 to 3000 copy range.” Which I’m starting to find faintly absurd, and wish I could see some actual numbers on. Coinweb suomi is the only data source I could find reporting on the subject. F&SF — whose editor asserted on the web last year that, if if hasn’t been for the hike in US postal charges, it would have been a good year for his magazine — has shed some 11% of its readership year-on-year. 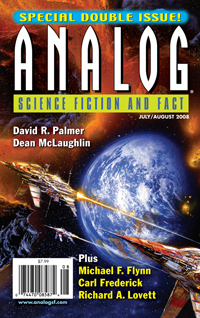 ANALOG came off best, though it should be noted that ASIMOV’S has staunched some horrific bleeding, having lost almost a quarter of its audience in 2005. These are the walking dead. Cases are always made that in fact these magazines are on strong — or at least survivable — financial ground. Even ignoring the fact that the money they offer for fiction is pitiful, I think that matters less than that they are reaching massively fewer people every year. One of the reasons we care, of course, is that we associate print magazines with an intelligent curation process overseen by functional salaried adults. That’s why so many people still look askance at the online scene as “not proper magazines.” The people who believe that got their wish last month, when one of the editors of HELIX SF had his covers pulled as a bigot with clear psychological issues by a disgruntled writer. It gives credence to the bias, unspoken or otherwise, that a print magazine is a job of work and an online magazine can be thrown up by any drooling lunatic with access to the net and a credit card. A fanzine by any other name. Regular readers will know that I like sending traffic to the likes of CLARKESWORLD and FARRAGO’S WAINSCOT etc from time to time. Aside from (patchy, beautiful) McSWEENEY’S, these are the places I look to for short fiction now. No real fireworks yet, no real movement, none of them seem to be really cresting the other in terms of profile, but the best work there has been head and shoulders over pretty much anything I read from ASIMOV’S, F&SF or INTERZONE (with one exception in the latter case) over the last several months. I live in hope that WEIRD TALES is preparing to post truly wonderful year-on-year figures. But, for the four magazines with available numbers (unless some communications failure has hidden a resurgence in INTERZONE numbers from the redoubtable Dozois)… it’s pretty much over. As was stated over and over last year, any number of things could be done to help these magazines. But, naturally enough, the magazines’ various teams appear not to consider anything to be wrong. They’ll provide what their remaining audience would seem to want, until they all finally die of old age, and then they’ll turn out the lights. 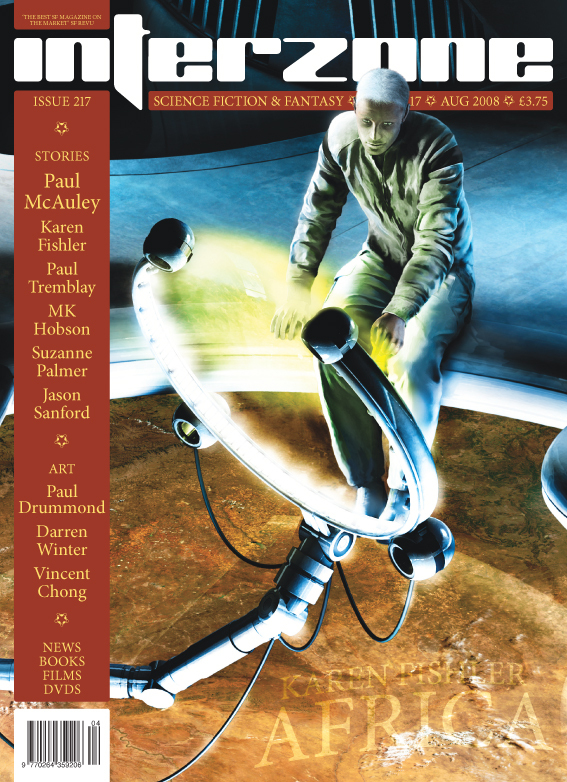 And that’ll be it for the short-fiction sf print magazine as we know it. It’s time now, I think, to turn attention to the online sf magazines. I personally live in hope that, one day, some of them move from net to print, and create a new generation of paper magazines. But, regardless, it’s time to focus on them — on what they do, how they generate revenue, and what their own future is. One hopes that community will run the pigs out of town before they find themselves having to lay down with them, too.